It’s been a long, brutal winter! A winter where we practically ran from the car through the garage and into the house and vice versa. After Christmas, the artificial trees, bins of ornaments, wreaths and whatever else was put wherever we could find a vacant spot. So, things have been accumulating for a number of months now. I loaded up a couple more bags in the SUV for the Salvation Army as we uncovered each layer of “stuff” in the garage today. (And I just made a run to drop off a bunch of things yesterday! Oh well!) I keep threatening the kids that I’m going to donate the two scooters we still have for some strange reason. I think their days are numbered. The kids are older now and have really outgrown them. I think they want to hold onto them for nostalgia’s sake, I guess. 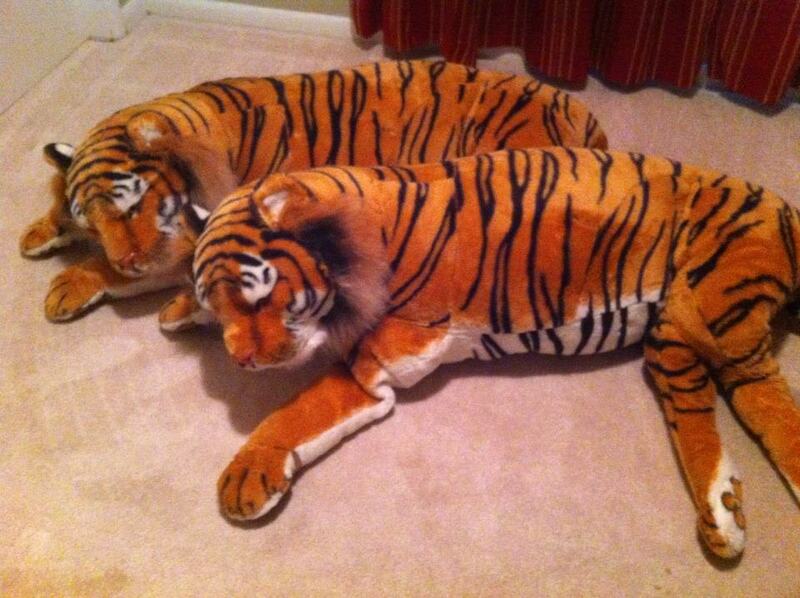 One day, they may “mysteriously” vanish to a better home, though. We have a whole Rubbermaid oversized bin full of outdoor sports equipment and they rarely, if ever, use any of it! That may disappear too soon. It’s a year of purging and simplifying! For goodness sake, before long, my daughter will be driving and my younger son not far behind her! Bigger wheels that rotate much faster will hold their interest then. The truth of the matter is, we just have too much stuff!! If it were up to me, we’d part with more than we already have. It’s a two car garage, but please tell me how one really fits two cars?! Maybe two Yugos or Smart Cars? Our convertible shares the space with a riding lawn mower and a Bow Flex contraption (poor dusty thing! ), along with a snow blower that we’ve never used, lots of boxes and paraphernalia. Over the course of nearly two decades of marriage, it is amazing how much accumulates! My husband had more pressing matters to attend to today, but, thankfully, he came out and helped me clear a bunch of things. I think he was worried I’d hurt myself as I’m recovering from a sprained elbow. He knows what happens when mom’s out of commission. Copious amounts of carry-out dinners… He even got the blower out and cleaned up a bit. We’ll have to finish up another day, but today was a great start! My main objective today was fueled by the fact that our HVAC guy will need to access the heating and A/C unit this week to perform the spring maintenance. Beyond that, it has been on my “mental to do list” for months, so I felt very accomplished chipping away at this chore. I’m delighted that spring has finally sprung! If, for no other reason, the garage walls were beginning to close in! 🙂 Of course, it’s a lovely thing when a gentle breeze sends the sweet perfume of the colorful hyacinths my way! Ah, spring, how I adore thee! Here’s to Super Spring Cleaning! What’s on your cleaning/organizing list for the spring? I recently removed all utility bills and some other paperwork over a year old from my files. I just don’t have room to store too much, nor do I need to. So I shredded the old files and was able to easily file the stack I’d been accumulating. I had to update a couple file folders with fresh labels as we’ve changed car insurance and trash companies. With all the paperwork in the proper file folders, I can quickly lay my hands on a recent bill or policy information. Proper organization will save you loads of time! I also wound up with a handful of cards from various occasions that I will store in a “Memory box”. I sorted through birthday cards I received and only kept the special ones. There was also a handwritten note on a 3×5 card from my oldest that he sent along with some pictures last fall. I should frame that actually. He’s a man of few words. 😉 One day these cards and notes will be neat to look back on. As I was sorting through this pile of paperwork, I came across several letters dated 1964 and 1965 (before my birth) that my maternal Grandmother had written to my mother. The stamp was of George Washington and was only five cents! She spoke of missing my two siblings that had visited recently and how she and my Grandfather (who I never met) felt “lost” without the children around. They really enjoyed them apparently, which is sweet to think about. They lived almost four hours apart, so visits weren’t that often, I suppose. 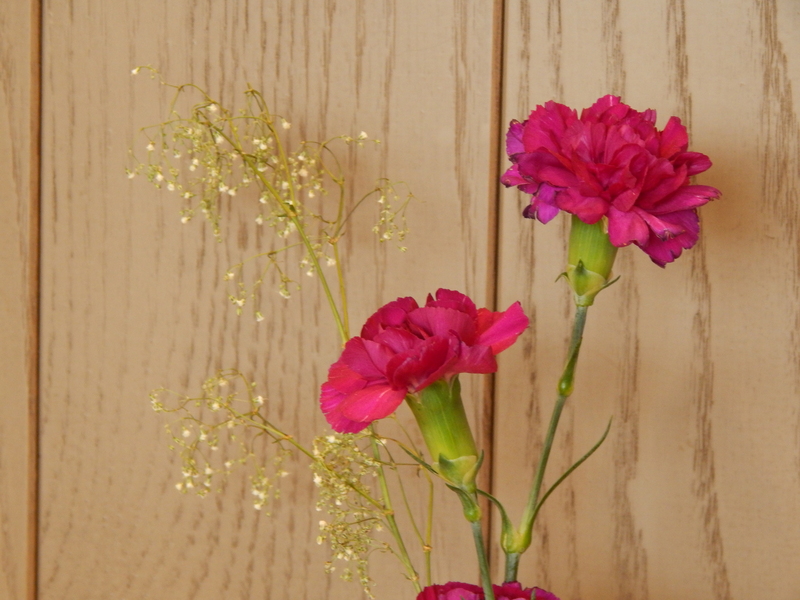 My Grandmother talked about them putting in a garden, Grandfather milking the cow and visiting relatives and friends. She even called the mail carrier by name. She said, “Well, I better get this letter in the mail as it’s just about time for Harry to come.” They lived in a rural area and times were much slower then. Hard to imagine. I’ll write more about my maternal Grandmother in another post. She was a special, special lady indeed. So, my filing journey took all sorts of twists and turns. It made me miss my Grandmother, my mother and my great aunt dearly. But, it also made me thankful for these little treasures that I can cherish to remind me of the sweet souls they are, until we meet again. I placed those letters in a plastic sheet protector and will file in my genealogy binder. I was able to whittle away at several stacks of paperwork and it feels good knowing that everything is in its proper place. Loose paperwork can very quickly get out of hand and that’s why it’s wise to have a holding place until you can get around to filing. If you file it right away, even better! I like to use these wooden in/out trays we bought (along with some furniture) from an attorney’s office that was relocating several years ago. We have three of them, two deep and one shallow. My husband uses one of the deep ones for his work related papers, and I use the other deep one as my filing “holding” place. It is easily stored on a shelf in the office closet and out of sight. One of the best tips I read some time ago was to open your mail near the trash can. I toss envelopes and unnecessary junk mail, etc., holding onto only the important pieces of mail. I schedule our bills to be paid right away online and we’re never late. It’s taken care of and I don’t have to think about it anymore. It’s so important to find a system to corral the chaos of your papers that works for you. We’re all unique individuals and have various preferences. Find something that works for you. That said, an indication that your “system” is not working is having to move piles and piles of paperwork in order to eat at the dining room table! Might want to revisit that. I’m amazed at how quickly things accumulate. In my cleaning up the office, I also came across a handful of note pads that my Dad had passed on to me. He gets goo gobs from charities and likes to spread the wealth. I moved those to the kitchen junk drawer where we always need something to write on. The key to maintaining order in any room is to have a set location to store things and regularly putting things away. Here’s to happy home organization! 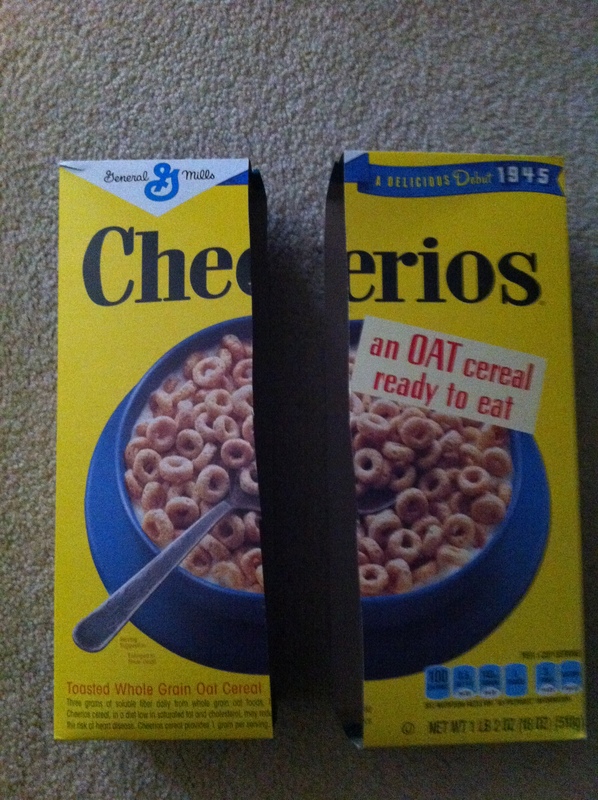 Cut a cereal box in half vertically & tape ends so it forms a tray, of sorts. 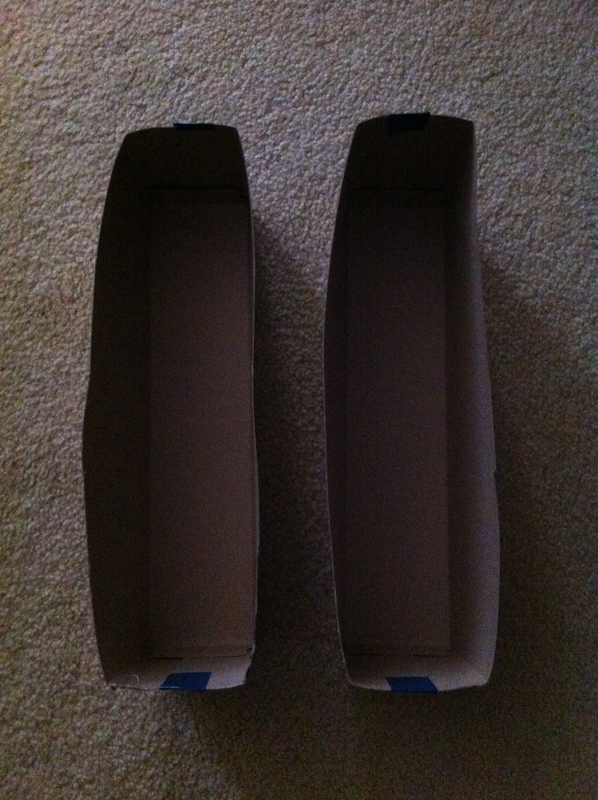 Depending on the size of your drawer, you may have to modify the length of the box. Fortunately, mine fit perfectly. I went around the middle of the “tray” once with tape for extra reinforcement. If you wanted to really get creative, you could cover the “tray” with decorative contact paper. Smile! You just saved yourself about $20! That’s $20 per drawer. I revamped 4 drawers, which would be $80! That would be insane to spend that much and my dresser drawers are odd sized, so there would be no guarantee of the fit. These are my husband’s work socks. He can easily grab a pair this way. See how our drawer is angled a bit. My homemade organizer fit just fine, thankfully! They even have bamboo drawer organizers out there. I’m sorry, but no one else is going to see my sock drawer but me. I am just not that high maintenance! Bigger fish to fry here. I’m all about finding creative solutions to avoid spending money needlessly. Spend it where it counts! Yes, I had too many socks! 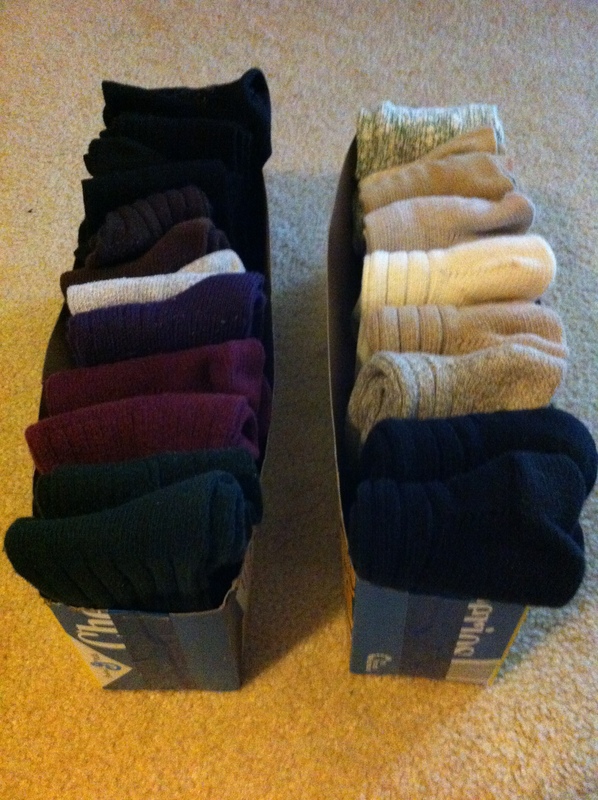 I still have about 20 pairs of athletic socks and 24 pairs of casual socks! Is that not crazy?! 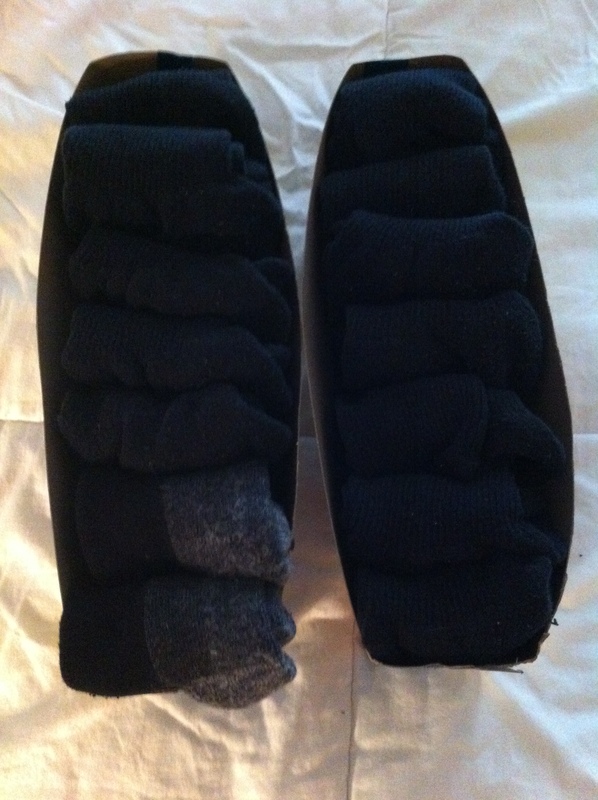 I can’t say I’ve ever counted my socks before, but as I loaded them into the trays I did and was amazed! I can only wear one pair at a time after all, and I do laundry at least once a week, so parting with the above seems only reasonable. 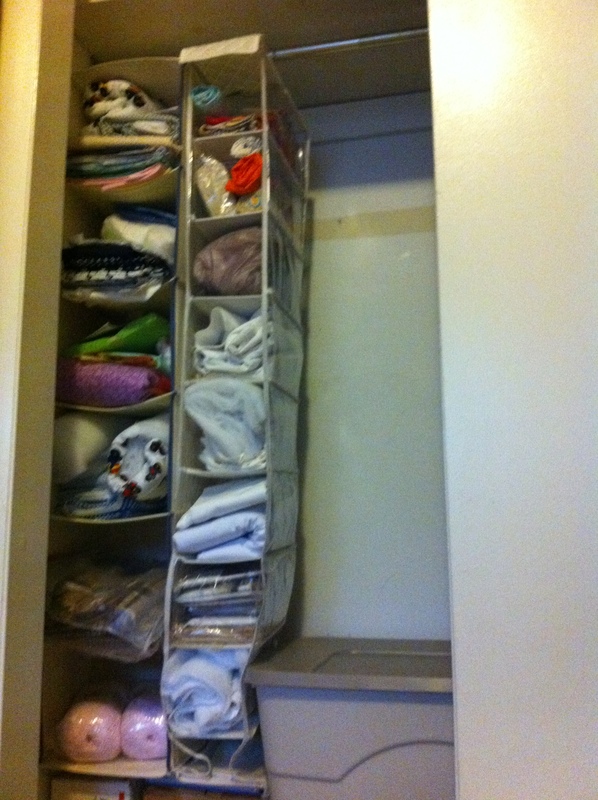 * I also overhauled my “unmentionables” drawer, turning them all vertically and into two rows. I have seen this done and wasn’t sure I would care for it. Yes, I’m a creature of habit. So, I thought that I would turn them all vertically and see how I liked it. If I didn’t, then I would just stack them like I usually do. I absolutely love the new system! I can tell at a glance where a particular color/style is and it’s just easier than rifling through a stack. Try it! You might like it too. 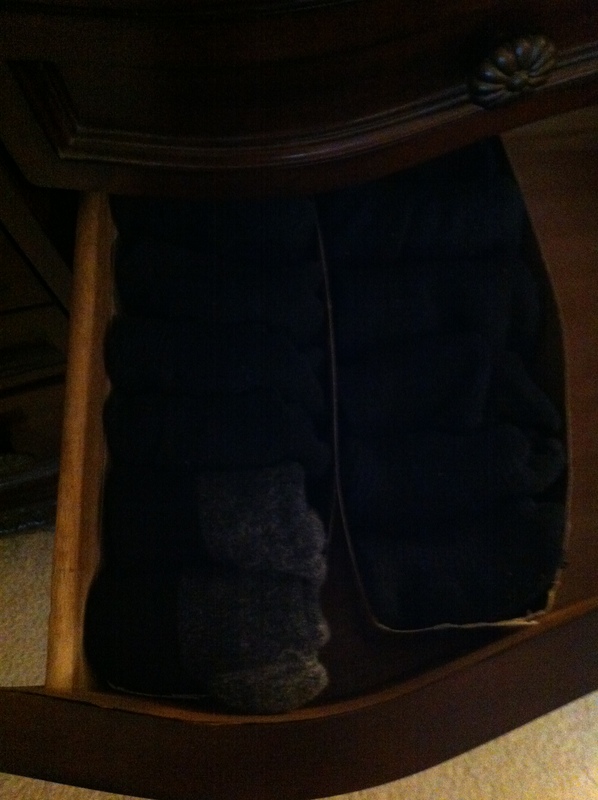 So … What do you all think about my sock drawer overhaul?? Does it sound like something that may work for you? 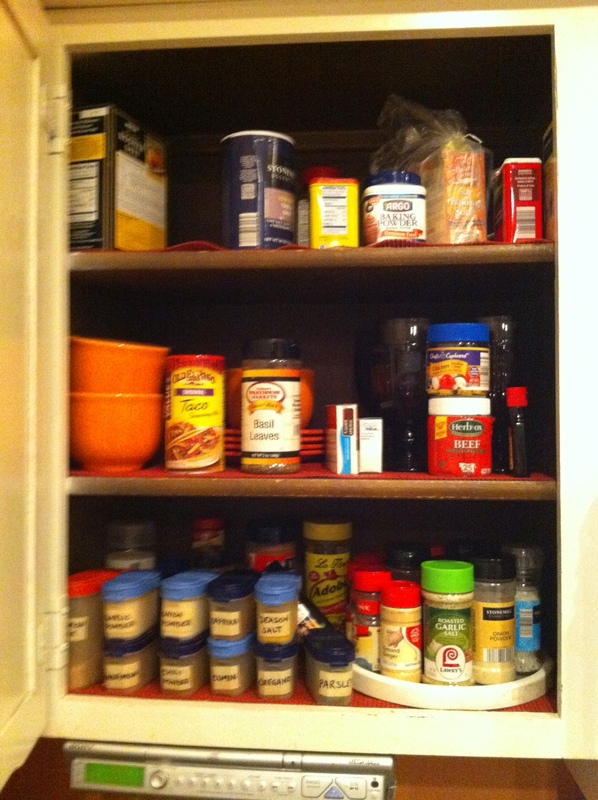 The above is the “Before” picture of my spice cabinet. As you can see, it wasn’t terrible, however, being the neatnik that I am, I fine tuned it a bit. I like knowing where things are at a glance. I took a couple things out and put on the big lazy Susan instead. Grouping spices together according to brand is pleasing to the eye, so I put all the McCormick’s together. I also buy a fair amount of store brands…they’re in the back. While it would be ideal to have another spice lazy Susan, I just worked with what I had for now. By taking a mental inventory of our stock, I know what we are running low on. I also found a new jar of chicken bouillon nestled inside one of the orange, Fiestaware bowls. I just bought a new jar yesterday because I thought we were out! This is where periodic organizing comes in handy, to avoid buying duplicates. 😉 I also tossed two containers of cupcake sprinkles as I don’t foresee any use and they’ve overstayed their time in my cabinet. 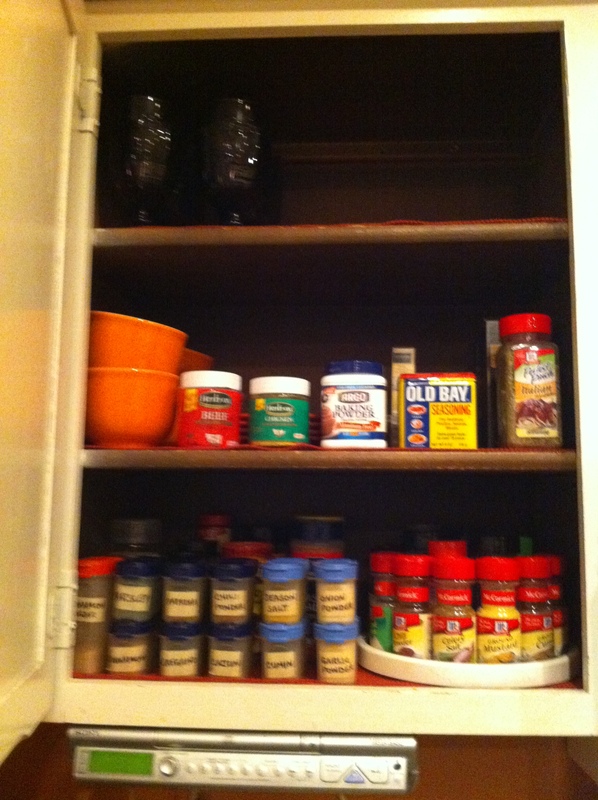 How do you like to organize your spices and seasonings? 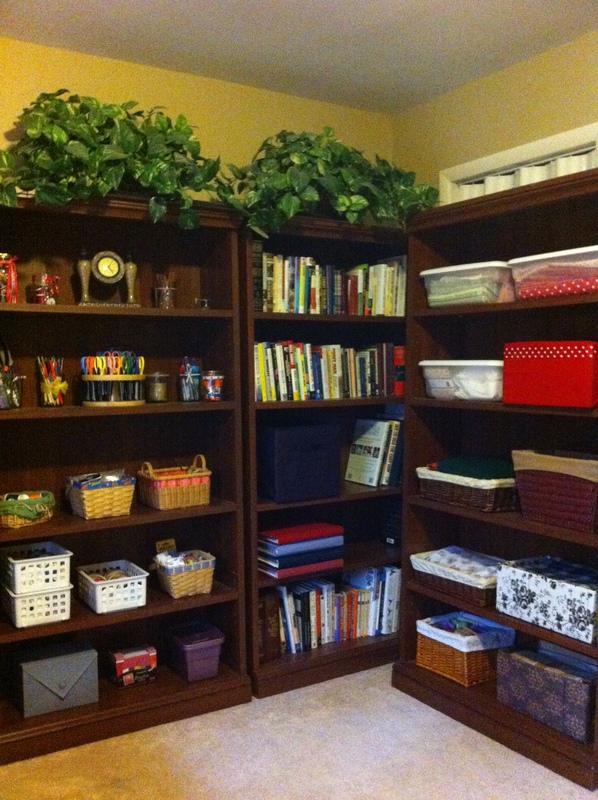 Today I decided to sort through some books in my sewing/craft room and tidy up the bookshelves some. My fabric and craft supplies were already in bins, baskets and boxes, but I fine tuned it a bit. I wanted to post a picture to illustrate how I used three cardboard boxes on the bookshelves as a thrifty container for my fabric. Can you pick them out? Each one is covered with a different material ironically. (Hadn’t thought of that until just now.) The red box is covered in fabric with a polka dot ribbon around the top. The black and white print is contact paper I purchased at the Dollar Tree a while back, and the box directly under that is actually covered with scrapbook paper. Most of the smaller baskets were purchased at a thrift store last year. And the three clear Sterilite bins were purchased from Walmart a while back. All in all, the cost for organizing my fabric and crafts was fairly minimal. I’m 100% for re-purposing boxes or other containers. Why pay so much for plastic bins if you don’t have to? My younger two children are 14 (soon to be 15) and 16 years old. As I was sorting books today, it was amazing there were so many they’ve outgrown. Many were already packed away, but a few stragglers remained, like: a paper airplane how-to book and a couple Klutz travel book/craft kits. It reminded me that you blink and the kids have graduated to another phase! I filled a bag to give to a new friend of ours with younger children. She’ll appreciate that. 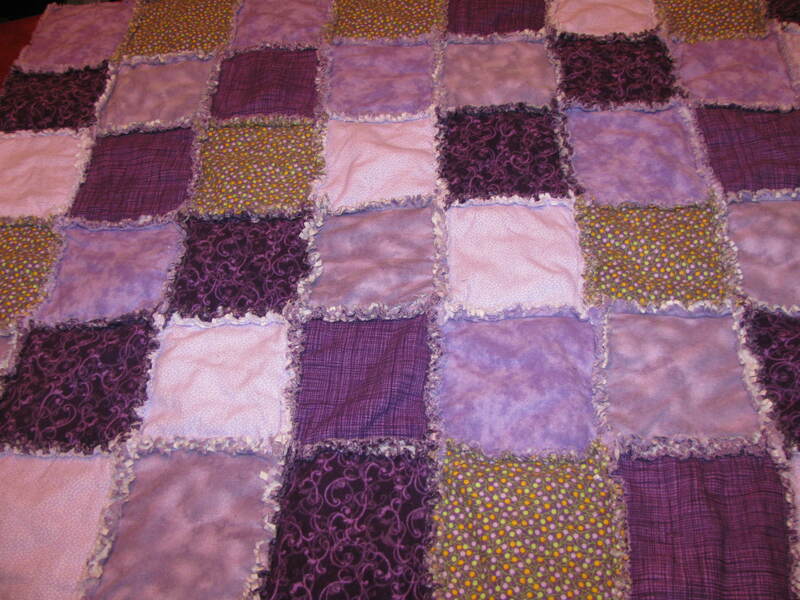 I can probably thank all that iced tea I drank, (and it’s only half caff) but I also cut out a baby quilt and batting while I was upstairs this afternoon. 🙂 So, it’s all pinned and ready to be sewn. Productive day indeed. It is my hope that this post may spark some ideas if you have a craft or hobby. Rethink that cardboard box or Folgers coffee container the next time you’re ready to toss it. It just may be what you need to corral your supplies. Incidentally, coffee containers can be very useful to hold nails, bolts, etc. My daughter just purchased 250 plastic snaps and my first thought after admiring the pastel colors was…Where are we going to store all these little bits? Fortunately, I had a Tupperware craft container on hand and gave that to her. Anyone remember those little blue oblong plastic boxes with the tray insert? They’re perfect for tiny things. I got that at the thrift store too several years ago for $1.50. Clothing and shoe closet hangers can be especially useful for storing fabric, yarn and just about anything. I can see the fabric and batting I have at a glance, so it’s pretty handy. We’ve had these hangers for almost a decade and they weren’t being used, so I snagged them for my craft closet. Zero extra cost to me. Take a look around your home. Chances are you have a box, basket or bin on hand that you could use in another area. If not, check out the thrift or dollar stores nearby. A dollar here and a dollar there add up over time! Here’s to thrifty household organization! I always say that if the house is clean, it means no one is coming over. And if the house is messy, we’re definitely having company! 🙂 Haha! How do we avoid the panic stricken frenzy when friends or family call to say they’re on their way? My personal favorite is when a neighbor shows up at the front door and the house is a disaster. Thankfully, that doesn’t happen too often. Put on your favorite music & set the timer for 15-30 minutes (or however long you like) to tackle a problem area. Somehow knowing you have parameters to work within make it more mentally tolerable. Select a room or area to tackle each week and focus on making it a peaceful, pleasant space. Invite friends over for dinner & clean like crazy. Make a list of tasks to be done as you go through each problem room/area. Note large items to be donated or sold. Get a kitchen trash bag and fill it with donations for your favorite charity as you go through the house. Sort dresser drawers, kitchen cabinets, books, DVD’s, etc. Whatever is not necessary, useful and loved…needs to go. Challenge yourself to view your home as an outsider, critiquing your setup. Do you have duplicates? Do you really need five staplers and four pizza rollers? Establish a set place for bills and important papers to avoid archive avalanches on the dining room table or counter. Baskets are a great way to keep like things together. Make up a bag to give to a friend who may need the “extras” you have. Grab another kitchen trash bag & go from room to room, collecting all garbage, snagging fast food cups or snack wrappers that may not have made it to the trash can yet, etc. Somehow removing the first layer, gives motivation to address other cleaning/organizing issues. If you are completely overwhelmed, enlist the help of a friend or family member. Moral support goes a long way. Start. Start somewhere. Even if it’s a kitchen junk drawer. One success begets another. Before you know it, you are on your way to accomplishing your goal of a clean house! I am a happy camper today! We visited a new friend, who is expecting her sixth child in a few weeks, and gave several bags of clothes and miscellaneous household items to her. We had such a nice visit over a cup of hot mint tea. Perfect remedy for a cold, rainy day! For the first part of our visit, her kids were watching a movie. Then, one by one, they each came out and I got to meet them. Precious. I asked my new friend if they would like a keyboard we have, along with the stand and bench; so she said they would. I’ll drop that off to her next week. I’m just so happy to give it to someone who I know can get a lot of use out of it. It’s been collecting dust in my sewing room, so I’m excited about clearing some space! Recently, our church asked for sheets for a local homeless shelter; and we came up with two kitchen trash bags full! I used to shop quite a bit at thrift stores and had stocked up on a bunch. We still have plenty, though. I was just glad to get rid of those extras! I’m anxious for spring so we can regain control of our garage! It’s been so brutally cold that we zip in and out, and that’s it. No dilly dallying! Last year we made great headway in the garage. We sold a foosball table and donated an extra riding lawn mower, so that freed up a lot of space. I recently sorted through all the toiletry items stored under the bathroom sink. How quickly things accumulate! I didn’t think it’d been that long since I last went through everything. Life gets busy and you blink, and it’s been six months or more. Anyway, I set a few things aside to put in the bag for my new friend today. (some hand sanitizer, lotion, shampoo, etc.) I had a bunch of Paul Mitchell shampoo and conditioner (travel size) bottles from last summer, so I put those in the bag too. I figured even if she didn’t want them, one of her daughters would think they’re neat. Why do we hold onto so many things? I try to be so frugal in a variety of ways, but sometimes it’s just time to let it go! I guess I’m in a real “deep clean/purge” mood lately. It just makes me happy to know someone else can use whatever it is that’s just sitting around taking up space in my house. It might as well be put to good use. Otherwise, what’s the point? When I was younger, I think we were more in the “amassing stuff” stage. We need stuff. We need lots of stuff. The more stuff we have the better. Now, we’re in our 40’s and I’m thinking we need far less stuff than we previously thought. Less = more. My motto for 2014 is: Simplify. I need less to think about. Less to maintain. Less, please. I’d like to focus on what’s important: God, my family, church, etc. … and less junk. Fewer distractions. More happiness. For you, it might be tinkering in the garage, reading, fishing or cooking. You fill in the blank. Some people suggest making a “Half way home” for items you’re not sure you should part with. Give it six months or even a year and if you haven’t missed it, go ahead and give it away. I thought that was interesting. I don’t feel like I need to do that personally, but it might work for some. Giving really does make the heart happy!